Improv Everywhere is well-known for the frozen Grand Central Station thing they did last year, and the spontaneous wedding reception they pulled off earlier this summer. Here’s their latest: a seemingly spontaneous musical number in the produce section of a large grocery store in Queens. I bet they were hoping to get the patrons in the grocery store to squish their fruit together, too. I think the onlookers might have participated if the request made a little more intuitive sense- I don’t really get the fruit-squishing thing and I’m gonna assume that means the grandmas in the grape aisle must have been even more confused. Still, fun! Here’s their interesting photo-essay about the process. Don't eat the silver one. 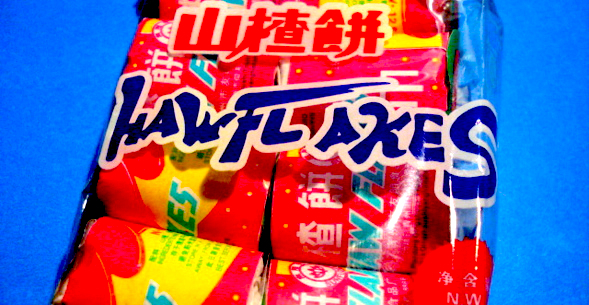 Haw Flakes are Chinatown’s answer to fruit leather. 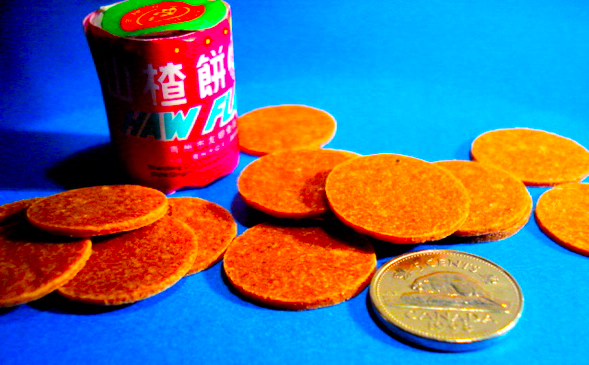 These coin-shaped bites of goodness were my mom’s most effective form of child-bribery, a much-anticipated treat to keep me quiet in the back seat during long drives home from Chinatown. Meanwhile, my mom sat up front with the twisty face of a salted-plum lover, but that’s another story for another day. I haw, you haw, she haw, he haw. Made of Chinese Hawthorn, these nickel-sized, pinky-beige candy discs can be found in just about every Chinese grocery store, for the suspiciously low price of $2 for four packages. Inside each package are 10 little rolls containing 15 flakes each. If you’re still doing the math, you’ll realize that this is a lot of flakes for a low low price. Too good to be true? Yep. True anyway? You betcha. Each roll of Haw Flakes comes carefully wrapped in a bilingual, eye-poppingly magenta label. The ends of each roll are capped with cheerful little paper circles marked “Sunflower”, ironically accompanied by an image of a lotus flower (look above the word “flakes” in the photo below). The package lists only three ingredients: Haw, Sugar, and the delightfully Engrish “Edibility Dye”. If these belonged to The Who, they would be a hoohaw. Haw Flakes have a distinctive scent- like lemony raisins with a hint of brandy- and a sort of crispy-crumbly-chewy texture (a contradictory triad, yes, but herein lies the mystery of this great Chinese confection). They’re not sticky like fruit leather, nor brittle like banana chips, but somewhere in-between. I like to push one flake at a time against my incisors and speed-nibble them- they have a firm, slightly gritty texture that dissolves into sweet, mild-tasting pulp, with a flavour somewhere between dried apples, fig newtons, rose petals, and tea. If you’re familiar with tamarind, they kind of taste like tamarind if it wasn’t so sour. Or they taste kind of like the sweet scent of an unlit cigarette. If you think that sounds gross, you probably haven’t smelled an unlit cigarette lately- unlit cigarette tobbacco actually smells really nice. Also, why aren’t there better words for tastes? If you ask around, Haw Flake enthusiasts may claim that the candy has vague health benefits- “good for digestion” was one I heard a few times. 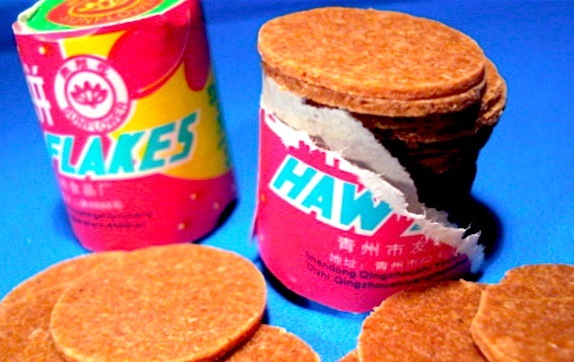 I can’t speak to that, but I will say that Haw Flakes are a pretty good gateway to the world of Chinese sweets, as their flavour, though distinct, is still somehow familiar, like a combination of other flavours you know and like. Plus, the fiddly little discs are fun to eat, and you can’t beat the price. And that’s that. Haw haw. World Grocery Store is a new post series I’m gonna do very randomly, describing the stuff I like to buy in independent grocery stores. You are currently browsing the archives for the world grocery store category.